Is it the CX-3 or CX-4? Mazda will debut a new compact SUV at the Geneva Motor Show in March. 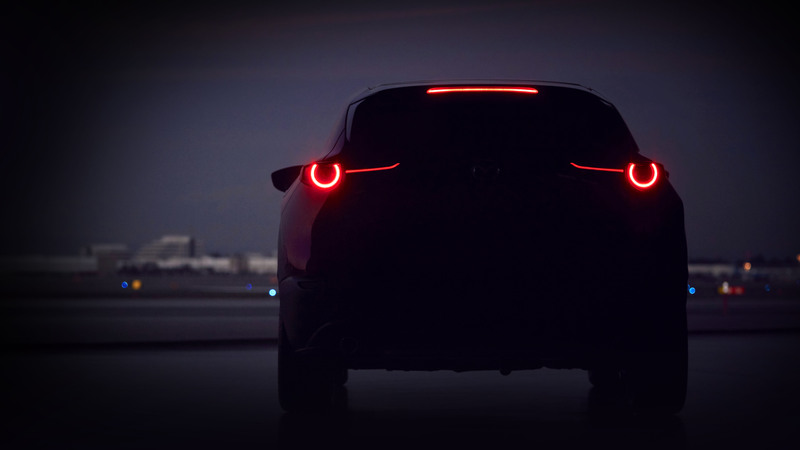 Ahead of the reveal, the automaker released an image of the SUV’s back end featuring U-shaped taillights. Mazda isn’t sharing the name of the new vehicle, so it’s anyone’s guess what we’re looking at here. It could be a replacement for the CX-3, although that model is currently a subcompact. Or it could be the next model up, the CX-4. This compact crossover is sold only in China right now, but Mazda might be looking to expand it into Europe. The model debuted at the Beijing Motor Show in 2016 and features coupe-like styling. Of course, it’s possible the SUV is something else entirely. Also, it’s unclear whether this new model will make its way to the North America. We do know the SUV will sit on Mazda’s new Skyactiv-Vehicle architecture. It will also feature Skyactiv engine options, including the Skyactiv-X compression-ignition mill. This engine uses a combination of spark and compression ignition to boost fuel economy and reduce emissions. Also, expect the model to feature the latest interpretation of the automaker’s Kodo design language. Stay tuned. We’ll see the SUV on March 5 when Mazda holds a press conference at the Geneva Motor Show.